To encourage outdoor seating and enhance the vibrancy of The Rocks a Commercial Outdoor Seating Fee Policy has been developed. Detail of the policy is outlined below. builds a vibrant, interesting and safe atmosphere that invites people to linger in the precinct for long periods. This Policy is to be read in conjunction with The Rocks and Circular Quay Commercial Outdoor Seating Policy 2012 and The Rocks and Circular Quay Commercial Outdoor Seating Technical Manual. The Commercial Outdoor Seating Technical Manual provides a guide to approval procedures. This Policy applies to all licensed outdoor seating areas within The Rocks. Licensed areas refer to the special use of the public domain, such as promenades, footpaths, thoroughfares, squares and places that are not a part of the tenant’s normal property lease. These areas are subject to individual special licence arrangements on a commercial basis. 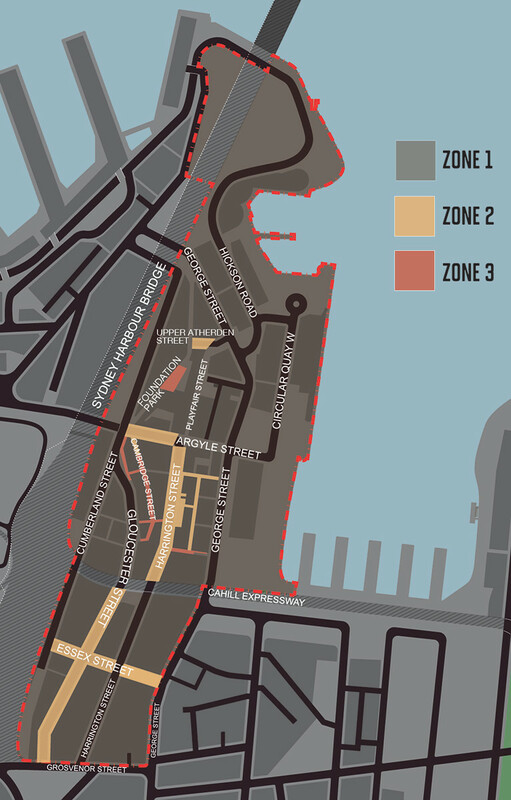 These price zones are in accordance with the City of Sydney’s and are applicable to 30 June 2017 (GST inclusive). Adjoining land use To ensure seating occurs to support existing and future uses, while not creating conflict with pedestrians and adjacent uses. Topography To acknowledge steeper gradients will affect the viability and pricing of potential seating locations. Pedestrian movement To encourage activation of streets and laneways with low pedestrian activity. Remarkable locations To reflect that the existing public realm experience will affect the desirability of potential seating locations. Access network To identify and activate poorly utilised spaces. As an active, evolving precinct, uses and occupation will change over time and this Policy and its pricing zones will be subject to regular review. For the purpose of this Policy, The Rocks is defined as the area bordered by Grosvenor Street to the south, Circular Quay to the east, Lower Fort Street and Cumberland Street to the west. Note that any current outdoor seating area with approval is not affected by this Policy. This Policy applies only to new development applications or changes to existing licensed seating areas.